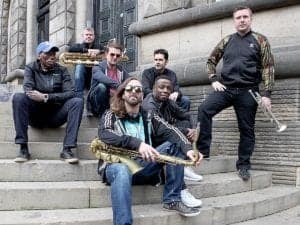 The Haggis Horns are a 7 piece live funk extravaganza combining heavy breakbeat funk, soul, hip-hop and afrobeat with the virtuosity of trained jazz musicians. They took a break from their tour to work with our students in workshops, treated them to an exclusive performance and shared some valuable tips. On Monday 16th of October a funk band called, The Haggis Horns, came to direct a workshop at the Academy of Music and Sound, Exeter. It was incredibly inspiring and I think we all learned a lot from the band. They performed two songs from their new album “One of These Days”. They blew us all away with their musicianship and excellent song writing; everyone loved it. They split the students into groups based on their instrument/skills and each band member led a group in creating parts for a song, which was later performed with all the students. It sounded amazing. The band really helped to provide musical inspiration to the students and to give them new and exciting ideas. It shed light on a new style of music that many of the students were not familiar with. I think that it really helped to expand their musical vocabulary and would definitely recommend The Haggis Horns to any musician wishing to find new and creative ideas.